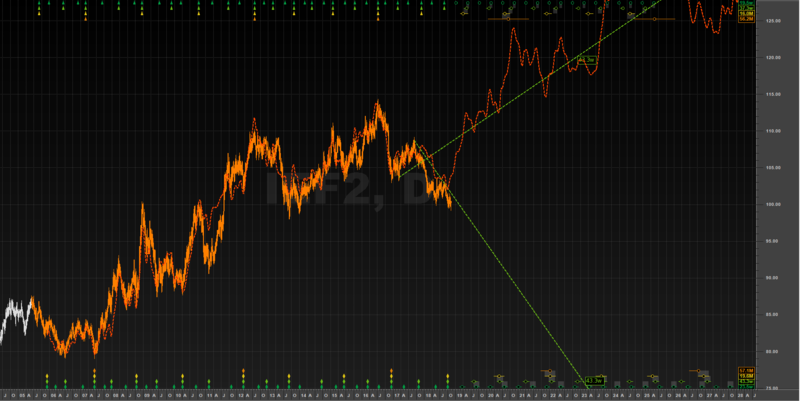 Time for IEF and TLT? No pinning done on either chart. To answer your question above-probably. In addition to cyclic analysis, positions of traders show a lot of big guys are short now (I use normalized COT values) so you could see a nice squeeze here. I’m not sure the default nominal model fits bonds all that well though. Should you use prices or yields? Rounded tops and sharp bottoms or vice versa? Probably the latter in both cases, but that could be debated. Spectrum (which doesn’t differentiate between the two approaches) shows pretty clear 90-91m and 45m waves on the longer side but the harmonics get a little flaky on the shorter waves. 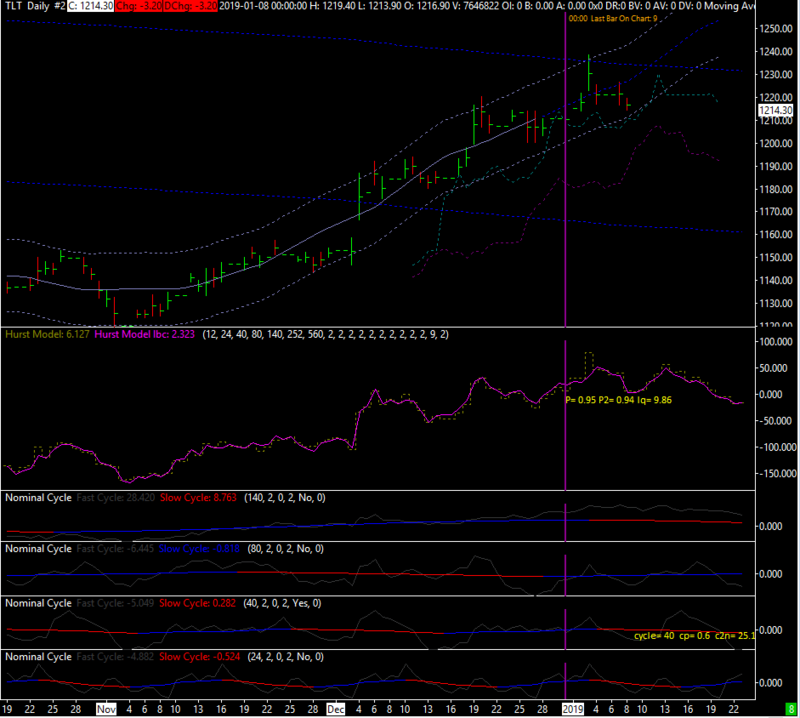 Look at a monthly close chart of long bond yields and drag a 91m cycle ellipse around it (don’t laugh, Hurst did it). It gives about the same result that you are expecting. The more I do this stuff the more I realize there are several ways to skin a cat. Another simple rule of thumb (always dangerous) that bond traders like me use-buy long Treasuries when the yield curve inverts. 3’s to 5’s inverted last week. A levered long Treasury/short stock portfolio will probably do quite well over the next year. One final caveat. Watch U.S. credit default swaps (yes they exist). Inflation is not a problem but the ability to pay might be someday with our MABA (Make America Broke Again) President in office. A sovereign debt crisis for the U.S. would certainly be a fly in the ointment for a long Treasury trade. 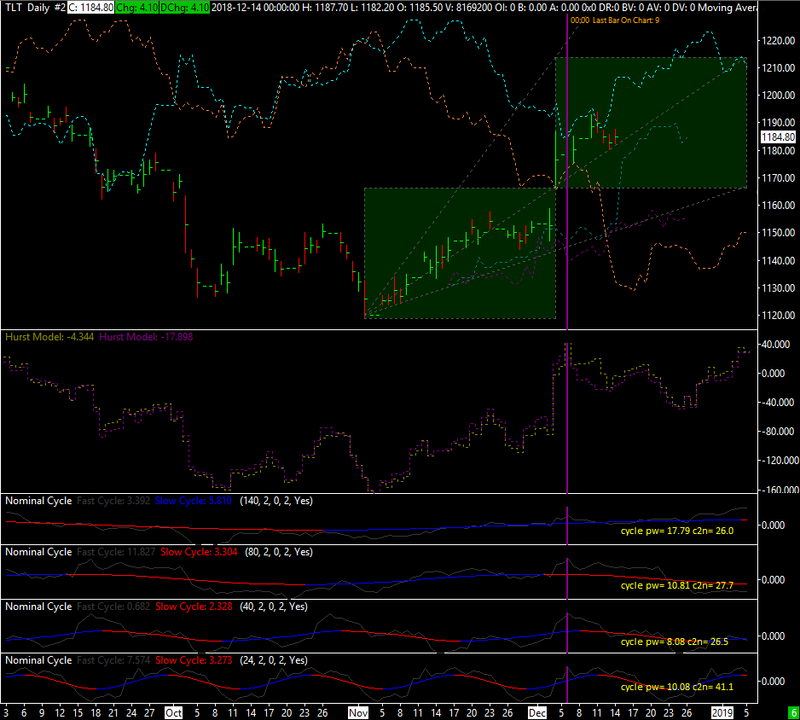 This is highly unlikely in my view but I still check CDS levels about once a week. Of course, if this became even a remote possibility it would be confirmed early on by cyclic analysis of Treasury prices or yields. Thanks Curt. Always good to hear from an expert! I’ve enjoyed the upward movement we’ve had in them so far. TLT tried to trick me once by stopping me out on 11/2/18, but I’ve seen that trick before and got back in on the next trigger buy. 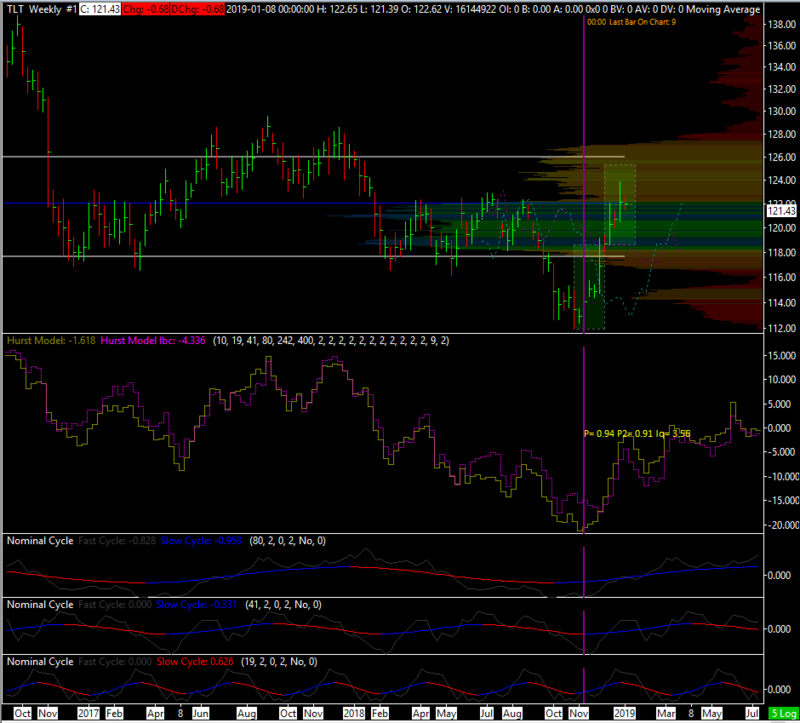 Both IEF and TLT have broken through their 18M FLDs. 18M VTL was crossed today. Buy the pull back due next month. 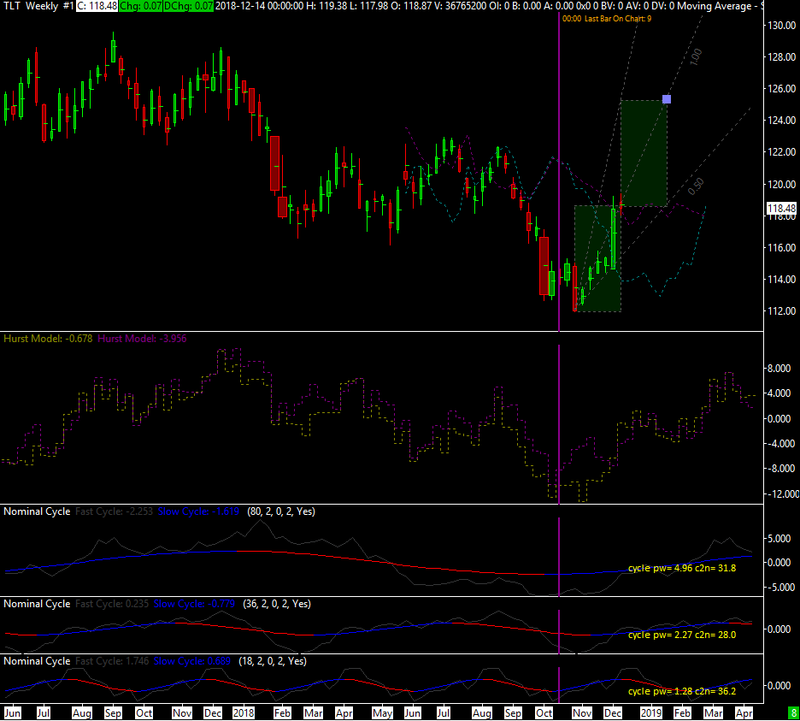 Below is the 10w-40w composite wave for Treasury bonds. The 31-32w wave has been running very consistently over the last 4-5 years and has a very high success rate in predicting profitable trades. It is due to trough in mid-May. The Fed announces tomorrow. Maybe they will be more hawkish than most expect after this vertical move back up in stocks.